We have a continuous 24 hour service (day and night) every single day of the year. Please telephone our funeral directors at our Sutton Coldfield funeral home on 0121 313 0054 for immediate advice, support or with any enquiry you may have. There will always be one of our funeral directors available to speak with you, to answer questions, to offer advice. Our personal approach ensures your family will have your own personal funeral director from first contact, and then remaining with you throughout. We are happy for one of our funeral directors visit you at your home address in Sutton Coldfield (if you would prefer, or are unable to visit us) and will also make evening or weekend appointments for your total convenience. Follow Walmley Road to the traffic lights with Walmley Ash Road/Penns Lane. Continue straight on to Eachelhurst Road. We are approximately 800 metres on the left, on the corner of the row of shops. At the traffic island with the Bagot Arms Public House, follow the Eachelhurst Road (with Pype Hayes Park on your left) for approximately 1km. We are on the right, on the corner of the row of shops. 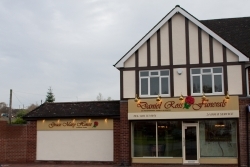 We are funeral directors situated in close proximity to Good Hope Hospital and to Sutton Coldfield Crematorium on Tamworth Road. We have visitor parking in front of the funeral home.